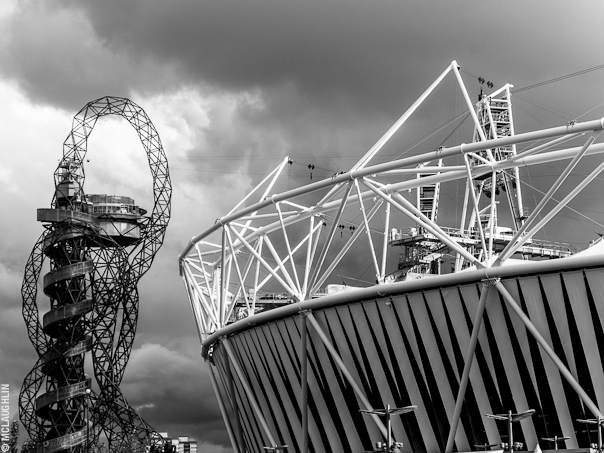 Ever since seeing the Olympic Flame shortly after moving to East London, I was hooked on the Olympics. Of course, by then it was far too late to think about getting tickets to see the games. Thankfully I got to watch some of the games at Victoria Park, which was awesome. However, I really wanted to go for a wander around the Olympic Park before they take it apart as part of the Olympic Legacy. As a Tower Hamlets resident, I was told I could get park tickets during the Olympics, but when the games actually came around, there was just nothing available. I tried and tried getting tickets for anything I could through the London2012 website, but I was just met with more and more frustration each and every time. The same thing happened when I tried for Paralympic tickets, so I was so grateful when my good friend Alison at Felicities PR told me she'd got a bunch of Olympic Park tickets during the Paralympic Games! The park is vast. I mean I knew it was big, but it really does kill a good few hours walking around it. What the architects have achieved in what was just an industrial wasteland is awesome. The amount of greenery around the canals is fantastic considering what was there before. I also love how the permanent structures like the aquatic centre and the velodrome are beautiful buildings that will continue to be beautiful long after the Olympic buzz has faded. Many many years ago, I took a wander around the Olympic Park in Barcelona, several years after the 1992 Olympics. As beautiful as it was, there was nothing there. I think that's one of the things they wanted to avoid with the London Olympic Park. It's all about legacy. There was criticism of the flame only being visible from inside the Olympic Stadium, and whilst I do wish I could have seen it myself, I am glad it wasn't a permanent structure within the park. There's something quite sad about an extinguished flame. Compared to the Olympic Park layout in Beijing, the London2012 Park is kind of an unorganised hotchpotch of buildings and open areas that at first glance doesn't really seem to have much of a thought out plan to it. However, that's what London is - It's a hotchpotch of ideas, buildings, cultures and people, and the Olympic Park really reflects that. I'm so glad I got the chance to see the park, even if I didn't get to go inside any of the venues. These games are all about "legacy", so I'm really interested to see how it turns out after all the temporary structures are removed and it's reopened to the public.